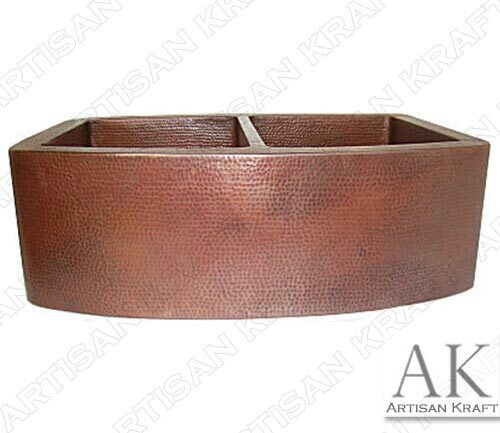 This two basin copper kitchen sink is pictured with a hammered finish. The hammered finish is an almost scale like bubbly finish on the surface. It can also be made with a smooth finish. Copper is a fantastic choice in material. It stands out in any kitchen that it is installed in. Match it to a copper kitchen range hood or a rustic cast stone. This 2 basin sink is a perfect match for a traditional kitchen or a rustic French style. It can be installed under-mounted, on the counter or flush with the counter. The front arches out giving it a unique look. All of the outside corners are rounded as well as the interior basin corners. The rounded corners soften the appearance. Nickel is another finish that is often paired with copper. Here is an example of a Nickel Freestanding Bathtub on our bathtubs page. The Chicago showroom has a great display of stone sinks. Price: Please or email for pricing.